This past month, a new seating area was completed in HSC Fireside Lobby. The seating area features a high countertop with chairs that runs the length of the west wall. The countertop faces the window and overlooks the hill to the Aerie. Since its completion, students have taken full advantage of the seating area, using it for studying and meeting up with friends. Student groups have also used the countertop for food and supplies for their events. Not even a month old, the HSC fireside countertop has already earned its place. Northwest University is always making plans to update student spaces. 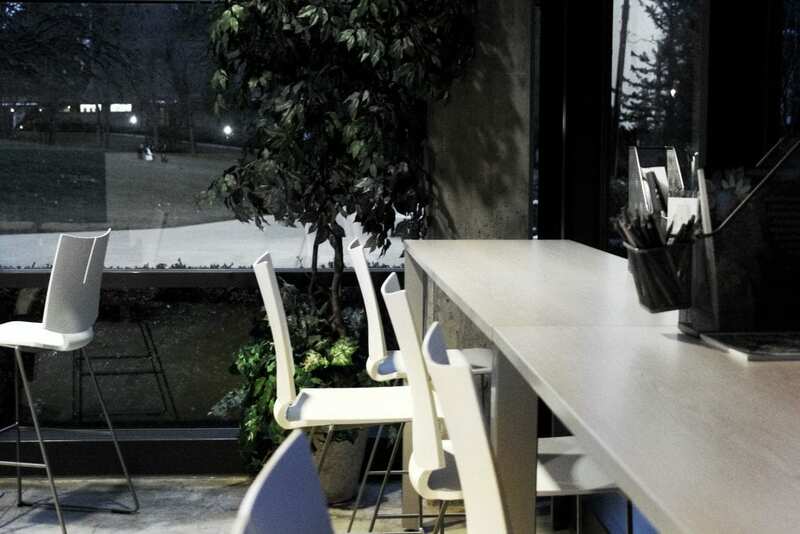 Perks lounge and Pecota student lounge were redone in the last five years, and the university plans to update more student spaces in the years to come. Conversations about potential future projects have included adding picnic tables around campus and updating outdoor common areas like HSC patio. ASNU decided, however, that the HSC fireside area was a priority. The HSC countertop project has been in the works since last year. ASNU Vice President Alex Lee explained that the idea for the seating area in HSC topped the list of potential projects on several student polls last year, but this year’s team did the work to finish it. “A lot of work was done this year because we had to look at colors, measurement, and design. While the decision was made last year, a lot of the work was done this year,” he said. Lee also explained that while there is a lot of space for socialization in HSC fireside, there was not a lot of dedicated study space. HSC fireside is also frequently used for events, so any additional study space would need to be dual-purpose, or at least out of the way. A window-facing counter top could serve all these purposes, and also take advantage of the view from the floor-to-ceiling windows. Design for the new space was inspired by the work done in Perks Lounge, the Pecota student lounge, and even the Houghton Plaza Starbucks down the street from campus. NU Director of Community Life and ASNU faculty advisor Larissa Lilly said that a countertop looked like the best option for the space, both because it worked so well in past lounges and because of the way the space is used. Once ASNU realized the need for a study space in HSC, approval was needed from higher-ups and those affected by the space. Lilly was the main spokesperson, going between ASNU and the provost, the deans of the College of Arts and Sciences and the Buntain School of Nursing (who reside in HSC), the president’s cabinet and maintenance. ASNU’s work seems to have paid off, as the HSC fireside countertop has gotten plenty of use in the past couple of weeks. Students have been occupying the counter with coffee, laptops, notebooks, and even coloring pages. The space has been fuller and busier than before, due to student suggestion and ASNU action. ASNU said they would like students to reach out if they see a need on campus. They seek to be a voice and a resource to students, and projects like the HSC fireside countertop would not come to be without student input. If you have questions or suggestions, email asnu@northwestu.edu.